Giovanni Albini (b. 1982), composer, devoted himself with special interest to mathematically informed aesthetic theories of music composition, developing a unique style that takes a highly modern approach to Western musical traditions through mathematics. 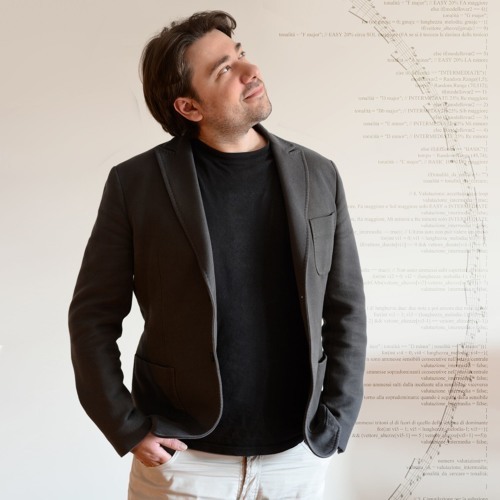 He is professor of Music Theory at the Conservatory of Udine (IT), lecturer at the Conservatory of Pavia (IT), visiting lecturer at the Conservatory of Lugano (CH), and academic member of the Istituto di Studi Superiori dell’Insubria “Gerolamo Cardano”. He holds a BM, a MM and a PgD in Composition, a BS and a MS in Mathematics and a MM in Classical Guitar. He is also a PhD student in Composition at the Estonian Academy of Music and Theatre in Tallinn (EE). His theoretical research focuses on mathematically informed aesthetic theories of music composition, mathematical music theory and its application to composition with special interest to soundtracks for interactive media, algorithmic music and non linear composition systems. He has given several lectures on these topics at many universities and conservatories including Yale University (USA), Universidad Nacional Autónoma de México (MX), Open University (UK), Lithuanian Union of Composers (LT), Università degli Studi di Milano (IT), etc. He has written several concert music scores as well as many tracks and sound designs for video art, exhibitions, multimedia, commercials, trailers, videogames and television. He is the founding Artistic Director of the highSCORE New Music Center and of the highSCORE Festival, today’s principal Italian Contemporary Music Festival offering masterclasses.